Are you in for a treat. This page offers the Ultimate Magnifying Glass. 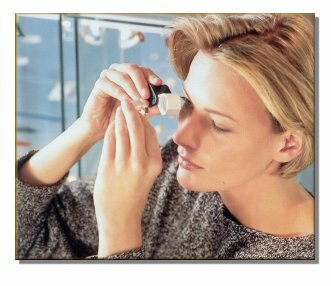 As dealers, we have been using an older 6x Zeiss magnifying glass for years. Recently, we found a better glass. We liked it so much, we now stock it a recommend it. Once you use this glass you will never go back to another. The secrets behind the quality of this lens are: an exceptional field of view for the magnification power; the aplanatic-achromatic design of the lens system provides distortion free view up to and including the peripheral zones; and an anti reflection coating which reduces lens reflection normally encountered with most lens. The glass is a Zeiss with anti-reflection coating. The optical quality is what you would expect form Zeiss: crystal clear, sharp across the field of view, and no trace of chromatic aberration in the corners. By far this is the finest jewelers loupe on the market. It is the most durable and strongest loupe that money can buy. The optics are unsurpassed by anyone, anywhere. This is the loupe to have - outstanding.